With more gold and platinum-rated bicycle communities than any other state and exciting cycling events for amateurs to pros, Colorado is the place to visit for fun on two wheels. Below is a sampling of mountain, road and cruiser bike rides you wont want to miss. Do You Know The New Denver? I recently spent some time rediscovering Denver. And, my how things have changed in recent years! 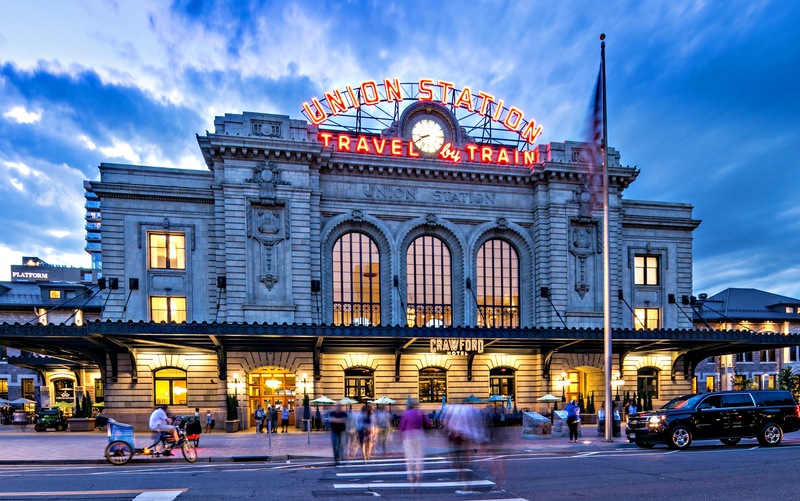 No longer a Western outpost, the Mile High City is now an internationally recognized community of arts, culture, and culinary adventure. Recently opened, this historic transportation center has been reinvented as a social gathering place that also houses bike, taxi, rail and bus lines connecting the city center to outlying areas. Stay onsite, in one of the Crawford Hotel’s rail-themed guest rooms and choose from an array of dining options and shops including the Tattered Cover, a famed indie bookstore. The station’s Grand Hall is a vibrant scene where visitors play shuffleboard, enjoy a snack, conversation and the parade of people passing through. The trendy hotel's unbeatable downtown location within the Union Station, combines unique historic elements with up to the minute amenities and top notch service. From art classes and kid-focused camps to clever “create and takes”, the Denver Art Museum welcomes families into the artistic fold. Family backpacks are available for use during a visit, chock full of art making tools, games and puzzles. Kids will also enjoy the Mile High city’s extensive public art program. Don’t miss a photo op with Blue Bear, a 40-foot playful sculpture that depicts the creature peering into the Colorado Convention Center. Introduce the kids to the world’s best street food at Linger, a trendy establishment that overlooks the city. The founders circled the globe in search of the fare that defines regions from Mumbai to Manhattan. Built in an old mortuary, the quirky interior is made up of cleverly recycled items including tables constructed from rail cars, formaldehyde bottles for water service and specials printed on toe tags. Pair your visit to Linger with a stop at the adjacent giant milk can for a sweet treat. The original Little Man ice cream shop is a local favorite known for their quality confections and the owners' community minded spirit. Denver’s environmental focus and commitment to reduced obesity and affordable transportation are just a few of the reasons the city supports an extensive bike share program. Residents and visitors alike can pick up a bright red bike at any B-station, and ride to their destination. When it is time to move on to the next museum, park or restaurant, grab another bike and go. The Cherry Creek bike path, a 15- mile path along the creek, provides a great way to see the sites and the city skyline while avoiding traffic. For information check out www.VisitDenver.com. Do you love to hike? Taking to the trails is a great way to introduce youngsters to the benefits of fresh air and the natural world. There is plenty of family fun to be found in mountain towns during the summer. Cool temperatures. Hiking, biking and family fly fishing abound. 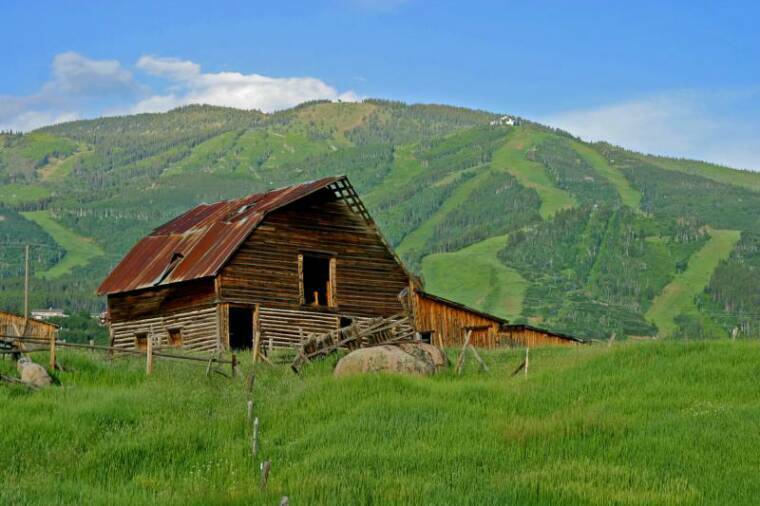 Ready to rodeo in Steamboat Springs, Colorado.? Your whole crew will enjoy witnessing the American tradition where the rough and tough iconic cowboy meets good, old-fashioned family fun. Check out these epic mountain towns while you are in the mood for high altitude fun. At least once a year a popular travel magazine will publish what is usually referred to as the “best drives in America.” Mostly, this list includes the usual suspects such as Route 1 along the coast of California, and I can see the authors of these lists rarely stretch their imagination much, or actually get into the hinterlands of America to travel some of the great, scenic stretches of asphalt that we have created in the interior of the country. My new, favorite ride, which covers what I call the trail of the American West, is a loop through north-central Wyoming that crosses paths with such truly American characters as Buffalo Bill, Butch Cassidy and the Sundance Kid, outlaw Tom Horn, Chief Red Cloud, Sitting Bull, General Sheridan and a host of others. If you’re more literary minded, somewhere on this journey you’ll meet the ghosts of Ernest Hemingway and Owen Mister, who wrote the first great book of Western fiction, The Virginian. Not all is in the past as you’ll definitely encounter the trail of Craig Johnson, the immensely popular local author who writes about a Wyoming sheriff in the Longmire books, which is also a television series. Finally, on this Wyoming loop, you’ll encounter some of the most beautiful, if not diverse countryside in the country, and the wildlife there-on. On my road trip, we saw deer, mule deer, moose, antelope and on the aviary side, pheasant, grouse and turkeys. My wife and I made this ride over the leisurely course of five days, never driving more than two to two and a half hours a day, and taking in all the sites the small, history-drenched towns had to offer. The loop begins in Sheridan then goes east over the Big Horn Mountains to Cody. It turns south to Thermopolis, then back east over a different section of the Big Horn Mountains to Buffalo, and finally turns north back to Sheridan. For those who have more time, there are numerous, spectacular offshoot drives in every direction from the loop: north to Little Big Horn, the site of General Custer’s demise; east to the Devil’s Tower National Monument; south to the Hole-In-The-Wall, a series of caves where Butch Cassidy, the Sundance Kid and other outlaws once holed up; and west (actually northwest) to Yellowstone and Grand Teton national parks. However, I’m going to stick to the loop. The city of Sheridan, named for famed Civil War General Philip Sheridan, was founded in 1882. It boasts a ton of history in and around the city. I got a late start at it all. Due to a mechanical failure on my plane out of Phoenix, I missed my connecting flight to Sheridan and didn’t arrive until the next day. So, I erased about a half day’s worth of touring. Nevertheless, I saw quite a bit in a short period of time. A good place to start is the historic Sheridan Inn, which is temporarily closed. The building is on the National Register of Historic Places and is approachable. Peer through the windows and you can glimpse the turn-of-the- (last) century. The hotel, which was once owned by William F. Buffalo Bill Cody, has played host to Hollywood luminaries, the Queen of England and the first great American writer to spil ink upon the local soil, Ernest Hemingway, who after holding up in a mountain cabin, came to the Sheridan Inn to celebrate finishing his book, A Farewell To Arms. Sheridan still retains the ambiance of the Old West, partly because it has the largest group of turn-of-the century buildings in region with 46 on the Historic Register. After you get past the Sheridan Inn, saunter the few blocks to Main Street and stop in at Mint Bar, which first opened in 1907 as the Mint Saloon. Like I said, it was a warm afternoon and I decided to stop in for a cold beer. There is a picture of the old saloon and it sure looked like I was sitting at the same bar, handsomely carved from local, burly pine (the burls were kept). This is definitely Wyoming territory, because the walls were adorned with stuffed Rocky Mountain fauna of every type -- as is almost every public pace you’ll visit. So did anyone famous drink at the old Mint Saloon? Probably, but in recent times Kenny Rogers filmed a western there (he was thrown through the front window), the rock bank ZZ Top stopped in for drinks as did the cast of the Longmire television show.. Stepping out of cool confines of the Mint Bar look across the street, there’s a nondescript store front that reads King’s Saddlery. This is clearly a case of looks can be deceiving, because somewhere behind the doors is one of the most fascinating things to see in Sheridan, if not all of Wyoming. The store is well known for selling saddles and ropes, some of which, especially for working ranchers and rodeo types, are hand woven. Although the retail shop doesn’t look much different from any other store, you need to know that this is just the front of a huge enterprise. A whole world is in the buildings beyond. Don King began making saddles in 1946 and became quite famous for his work. His saddles were featured in PRCA World Championships for six years. His success engendered this business, which is mostly behind the store front into which you just walked. When you make it to the back, take a look at the rope section, where hundreds of different coils abound. In fact, King’s Ropes are so well-known, the coolest thing you can do is buy yourself a baseball cap with the King’s Ropes logo. Not only has Johnny Depp been photographed with such a cap, but a character in the Longmire television show also wore a King’s Ropes cap. Sometime over the course of Don King’s life he began acquiring western and Native American memorabilia and artifacts, including hundreds of old saddles. After he died, his boys continued collecting and all that work is housed in another building beyond the initial storefront. It’s open to the public. Ask to see the Don King Museum. This is no small collection; it grew to thousands of items and is housed in two floors of what looked like an old warehouse. What’s there? The hundreds of old saddles, rodeo memorabilia, an old horse-drawn hearse, old rifles and guns including one found on the site of Little Big Horn conflict where General Custer met his demise, and on and on. Surprisingly, I still had my energy level on high even after the exhausting visit to the Don King Museum, so I hopped in my rental car and headed for the Trail End Historic Site, a turn-of-the century mansion, now restored, which was oddly designed in Flemish Revival style. The house was built by John B. Kendrick and after he died was home to his widow, Eula. From her bedroom, she could look out acros a thin river valley to her husband’s gravesite in the town cemetery. After visiting the Trail End house, I made my way to the cemetery, which not only has gravestones for Civil War veterans but has a couple of civil war canons as well. Wyoming is steak country, so don’t look for epicurean delights on this loop unless you consider Rocky Mountain oysters high cuisine. So, for your last interesting meal on this loop stop at Sheridan’s Warehouse 201, a restaurant in a converted warehouse. Since I missed my first night in Sheridan, I headed for accommodations that originally were designed to be for my second night, a lodge in the Big Horn Mountains. With daylight waning, we hopped in the car and drove what was essentially State Road 14 west into the Big Horns, where some peaks rise over 13,000 feet. I’m not going to say too much about the Bear Lodge Resort, other than it nightly houses more than its fair share of unusual characters, mostly hunters, fisherman and four-wheelers. However, when I awoke early the next morning I peered out my window to see a small herd of mule deer chomping on the grasses behind my cabin. Fifteen minutes out of the lodge, heading west through the Big Horn National Forest, we passed a moose walking through a swampy area of forest. After coming through the forestlands and a peak pass at over 9,000 feet, you descend rapidly into rolling, arid hills. This geography lasts all the way to Cody, which, as you might guess, was named for William F. “Buffalo Bill” Cody, who seemed to have been everywhere in Northern Wyoming. Travelers often say Cody boasts one of the best museums in small town America. I would report that statement condescends. Indeed, Cody boasts one of the best museums in America, whether in a big city or anywhere else and it is one highlight of the Wyoming loop. Plan to spend hours at the Buffalo Bill Center of the West, because it is actually five museums in one, the most recent addition being anextensive natural history wing. The other “museums” within the museum are dedicated to Buffalo Bill, his life and times; firearms; western art; and saving the best for last, the superlative Plains Indian Museum. I would recommend saving some time for one other museum in the area. That is the Heart Mountain Interpretive Center, which was constructed on the site of one of the country’s largest relocation camps for Japanese-Americans, who were displaced from their homes and shipped to remote locations during the World War II years. The site is about 14 miles outside of Cody, and well worth the visit. A lot of tourists wash through Cody, especially during the summer months, so to keep them entertained into the evening, the city boasts a nightly rodeo. It’s not the professional loop, but it was a first class competition and entertaining even for my wife and I, who consider ourselves city slickers. After overnighting in Cody, at the historic Buffalo Bill Village, where my wife and I stayed in our own little log cabin, we headed south to Thermopolis, which isn’t really an Old West experience, but is a unique part of the loop because of its famed hot springs. There is quite a bit to do at Hot Springs Park so save yourself some time for walking and riding about. 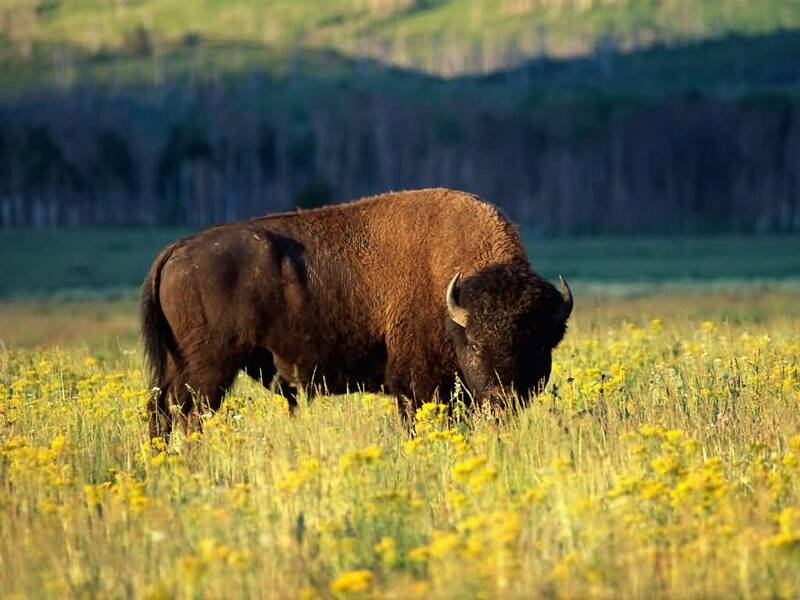 If you hadn’t yet seen any buffalo on your trip, included in the park grounds are hundreds of acres of rangeland reserved for roaming buffalo. Visitors are allowed to drive through the buffalo preserve. Thermopolis is not just the hot springs. The small city proudly brags that it has one of the finest dinosaur museums in the country. I checked it out just to be sure. It’s not the biggest dinosaur museum you’ll ever visit, but it is as good as it gets: great exhibits, great design and great dinosaurs. Well worth the visit. After a night in Thermopolis, I traveled east on State Road 16 to the Big Horn Mountains and entered the high, forested lands on a road further to the south than the one I took west a few days earlier. Another high mountain pass at over 9,000 feet and another bucolic ride through thick mountain forests. Eventually the road, descended into Buffalo, a small town with a great history. Collecting Western arcana must have been a big deal in the 20th century because the 1,500-item collection of Buffalo, Wyo., pharmacist Jim Gatchell laid the basis for the town’s robust history museum. Buffalo is the venue of the Longmire Days festival, because Longmire book writer Craig Johnson lives a few miles outside the town. If one reads the books or watches the television series, someone is always referring to Sheriff Longmire being at the Busy Bee Café. Look for the real Busy Bee on Main Street. Johnson is not the most famous writer to spend time in Buffalo. The renovated and handsomely revived Occidental Hotel has been around for over 100 years hosting many well-known personages including presidents Herbert Hoover and Theodore Roosevelt, Calamity Jane and Buffalo Bill, Butch Cassidy and Sundance Kid, the outlaw Tom Horn and the writers Ernest Hemingway and Owen Wister, the latter of which holed up at the Occidental to write the first great novel of the American West, The Virginian. Try to get the owner of the Occidental Hotel, Dawn Dawson Wexo to show you around. It’s like visiting a museum of the Old West and early 20th century. There is so much Old West history around Buffalo you might want to spend a few days here. I only had one day, so I chose to visit just one site, the TA Ranch about 20 minutes outside of town. The barn is on private land so you need to inquire if you want to make the visit. The land around the TA Ranch consists of rolling hills settled by farmers and ranchers, but in the fading evening light as I drove back into Buffalo, the wildlife had come back around and when you peered at the fields what you saw was not cattle and horses but deer and antelope. To complete the loop, I drove the next day from Buffalo to Sheridan. If you get off the interstate there’s plenty more history to see, but I had a plane to catch, skipping such sites as the location of the Fetterman Massacre of 1866 or the more civilized Brinton Museum with a surprisingly strong collection of American art. I guess I’ll just have to come back. My intention was to make a driving loop through Northern Wyoming. I flew into Sheridan via Great Lakes Airlines (www.greatlakesav.com) where I rented an Avis car (www.avis.com). In Sheridan, try the Sheridan Mill Inn (www.sheridanmillinn.com). But, if you want to get a head start on the loop, you might head for the Bear Lodge Resort (www.bearlodgeresort.com) in the Big Horn Mountains. In Cody, I stayed at the historic Buffalo Bill Village with its individual log cabins (www.blairhotels.com). When in Thermopolis, the Thermopolis Days Inn boasts a uniquely natural history-like décor (www.daysinn.com/thermopolis). Finally, when in Buffalo head to another historic building, the Mansion House Inn (www.mansionhouseinn.com), where your hosts make a great breakfast. Mountain towns offer fresh air, music under the stars and active pursuits for all ages. Check into a guest room or one of 25 private residences within the Arabelle at Vail Square and you’ll be perfectly located to enjoy a high altitude stay in one of the country’s most popular and family-friendly resorts. Hop on to the Eagle Bahn gondola just outside the hotel to access mountain top hiking, biking, snow sports, Adventure Ridge family activities, music, dining and jaw dropping sunsets. During the summer, Fly fish Gore Creek or cool off on a kayak or raft trip. Coming soon: a 1200-foot zip line. Adjacent to the vast expanse of Frank Church – River of No Return Wilderness, this vibrant high altitude enclave serves as an ideal base camp for exploring the beauty of the Sawtooth Range and the nearby mountain lakes and trails. Then return to town where activities from horseback riding, mountain biking, fly fishing, tennis, golf and shopping will keep your clan engaged. When planning, check dates for outdoor summer concerts, plus art and music festivals. Don’t miss the weekly ice skating shows at the Sun Valley Lodge featuring world-class figure skaters and Olympic medalists. Learn how cider is made. Hop aboard a dogcart, (a sled on wheels), and take part in sled dog training. Consider bungee jumping, canoeing, the alpine slide and carriage rides during a summer visit to this storied New England playground. You’ll also find hot air ballooning, mountain biking, mini-golf, zip lines and swimming available for family fun in the 200 year old village that is also home to Mt. Mansfield, the state’s highest peak. Lodging options, from quaint bed and breakfasts to more modern hotels, abound. Just 80 miles from the Grand Canyon and close to seven other parks and monuments, this college town offers a long list of options for family travelers. At 7,000 feet, you’ll enjoy hiking and biking amidst Ponderosa Pines, comfortable in the cool mountain air. Tap into the history that combines the nostalgia of Route 66, the historic “Mother Road” that bisects the town, as well as the rich legacy of the old west and the Native American culture. Don’t miss a tour and exhibits at the Lowell Observatory, the astronomy research center where Pluto was discovered. Visit this Blue Ridge Mountain wonderland for lively music festivals, kayaking, biking and the chance to check out more than 200 waterfalls in the region. Notably, the Brevard Music Center offers a wide range of concerts throughout the summer, offering performances that include mountain songs, classical and opera. Many are held outside and are free. A portion of the film The Hunger Games showcased the beautiful landscape and waterfalls in the nearby DuPont State Forest. Today I was reminded why they call one of my favorite sports “fishing”. It was a beautiful day in the Vail Valley and my son Alex and I headed out for a morning of “Walk and Wade” fly-fishing with a guide from Gore Creek Fly Fishermen.